LOVE DIY flaxseed gel but don’t have the patience or the time to keep making it every week? You’re going to LOVE the Arata Hair Gel! In the hunt for inexpensive, alcohol-free, silicone-free products we can often compromise on other ingredients, which can make them harmful to use continously. That’s not the case with Arata Zero Chemicals. Like their name claims, they create 100% plant sourced, cruelty free products. 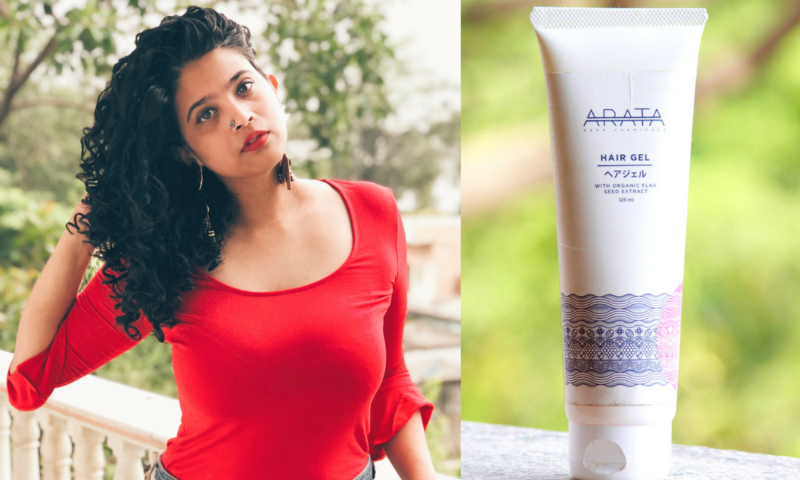 They have lip balms, face washes, bodywashes and more but it was the Arata Hair Cream and Hair Gel my followers tagged me in and asked me to review. Thank you to the team for sending the products across to try! They’ve also given a discount code for you guys so that you can SAVE 15% on your order should you choose to buy it. Find the code and my review on Arata Hair Gel below! 2.3 Texture: Slimy like DIY Flaxseed Gel. It glides easily. 5 Why Should You Use A Gel? No fear of hair fall, thinning or whitening ever again. Arata Hair Gel is a 100% Natural medium-to- strong-hold hair gel packed with all natural goodness. It yields international salon-standard looks, without the damage caused by parabens and chemicals found in existing hair products. This 0% Chemical hair styling gel is just what you have been waiting for. Our unique formula contains Natural Flax Seed Extract and eliminates the risk of hair damage without compromising on results. Texture: Slimy like DIY Flaxseed Gel. It glides easily. Organic Flax Seed Extract, Propanediol (VegetableExtract), Dehydroxanthan Gum (Natural Sugar Extract), Lonicera Caprifolium (Italian Honeysuckle Extract), Lonicera Japonica (Japanese Honeysuckle Extract), Water, ECOCERT Natural Fragrance (Flower Extract), Sodium Gluconate (From Sugar Glucose). Yes! Unlike most hair gels available, especially in India, Arata hair gel does NOT have any drying alcohol or bad ingredients. It is also Protein free. Why Should You Use A Gel? Gels add definition and can drastically reduce frizz in wavy and curly hair. Since gels form a cast around your natural hair and helps them remain clumped together, it also protects your hair from getting frizzy. Moisture isn’t allowed to leave your hair or enter it from your environment, which in India is SO important! We live in mostly humid, sticky climates and a gel can help your curls to remain defined LONGER. Plus many people with wavy hair feel a leave in conditioner weighs down their hair and rather use a gel to fight off the frizz. On wet hair, after applying a light leave in conditioner/ curl cream (I’ve used Cantu Curl Activator in the pic above), take a big dollop of the Arata Hair Gel and smooth it on to the hair. PS- If your hair doesn’t like creams and leave in’s simply use the gel to style straight after your shower. I know many wavy girls who do STC in the shower and just style with a gel later. You can simply scrunch up after this with a t-shirt or use a styling comb to comb through the product. The former will give you fatter, bigger clumps and using a styling comb will give more multiple, smaller clumps. Remember that if you have light wavy or curly hair, combing after applying a gel can open up the clumps. In that case, simply smooth on the gel and scrunch. After your curls dry, SOTC (Scrunch out the Crunch) with a light oil spread in your palms. Who says wavy and girls can’t rock a clean bun? If you’re in the mood for an updo that leaves your neck bare, or just having a bad hair day, try rocking a bun. Remember to spritz water on your hair, comb it back till mid length where the curls start and use the Arata hair gel to slick back baby hairs and make it look neat! You can watch the video below to see how I do it. Wavy and curly girls/boys who find their curls lose shape within a day and want them to last longer. If you live in humid, muggy places and need an extra frizz fighting product. You want to use gels but hate the crunchy feeling most gels give. Leave-in’s and curl creams weigh down your hair but you need something to protect them from frizz. You like clean, neat hair styles but suffer from hair loss when you use other gels. You want to make your curls & waves look more defined. This will change from person to person. You need to apply enough to coat the hair. This consistency is slightly runny so I don’t need a lot for each section. Keep trying until you personally get results you like. Remember, if your curls become straight and stiff- then you’ve applied too much. DON’T forget to remove the gel cast after your curls fully dry by scrunching with a light oil. This breaks the cast, makes them softer and more voluminous! You know how big of a fan I am for Ecostyler gel. To find I have similar results with the Arata Hair Gel is a lovely surprise. Since the consistency is slightly watery and slides easily, it keeps my curls moisturised too. I do find it leaves a light cast when I’m heavy handed with the gel but I can easily break it with SOTC’ing it. Granted, I spend most of the day indoors in an air conditioned office except while travelling in the metro and auto to and fro. Remember, don’t buy this gel expecting a hard cast. It’s light and doesn’t weigh down your hair. Water Soluble so no build-up! Great for curly, coily hair types and wavy hair that gets stiff with other hard hold gels. It pairs well with other styling products. Light cast means it’s more susceptible to the weather, especially super humid areas. If you’re looking for a really hard hold gel, this isn’t it. Or use any other leave in conditioner/curl cream you have in your arsenal. Don’t forget to check out my review on the Arata Hair Cream. Until next post, i hope to see you saying hello on my Instagram- please don’t feel shy! I post my outfits, curly hair tips and more! Where online do you buu the Cantu curl activator? Amazon! I think I linked the answer in another comment of yours. Where do you buy your Cantu Curl Activator? Which online shop?